Have you been troubled with the problem when you got corrupted DVD, video CD or MP3 compilation and you cannot copy it to your hard drive? Using ordinary methods you are not able to copy or recover the files from damaged DVD or CD. 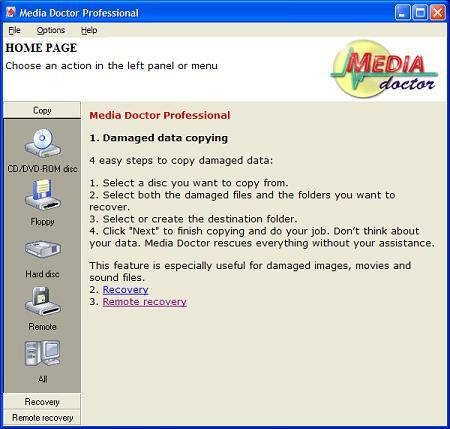 We introduce you Media Doctor - effective software solution for data recovery from damaged DVD, CD, floppy disks etc. Media Doctor will recover your DVD completely! Another outstanding feature of Media Doctor is the ability to recover a file using several damaged copies of it as the source. This feature is irreplaceable when you have corrupted data on CDs, DVDs or floppy disks and you need to copy it to your hard drive. Such recovery method is widely applied when you rescue data recorded on floppy discs. Moreover, you are able to recover files remotely having two copies of Media Doctor installed on two remote PCs with internet connection. This feature is available only in Media Doctor Pro. Furthermore, Media Doctor may be used for speeding up the copy process of DVDs and CDs. Due to its special fast copy algorithm Media Doctor works faster than every file manager, that's why it can be used for fast copying of the data from DVD and CD discs. For your comfort, Media Doctor has advanced copy options: you can pause the copy process at a moment, shutdown your PC after copying, or use fast copy method for huge data volumes. You may also use other advanced features like database for damaged files and showing of bad sector map. Working with Media Doctor is easy and understandable even for inexperienced users owing to its wizard step by step interface. Media Doctor is the complete software solution in cases when data recovery from damaged drives is needed. Media Doctor is irreplaceable for data recovery from corrupted discs, containing audio and video files, pictures cliparts etc. Furthermore, Media Doctor has file assembling function which is very useful when you store your data on floppy discs. The program will assemble a file even if you have several file copies damaged. Moreover it is recommended that you use Media Doctor for ordinary files copying due to its high-speed copy process. Media Doctor copies files in many times faster than every file manager. Sony Memory Stick, CompactFlash, SmartMedia, SD, MMC cards, etc. Copy corrupted files. It is especially useful when you copy movies, pictures or audio files from damaged CD/DVD discs. Complete file recovery from several damaged copies. It is useful when you store files on floppy discs. Recover large files remotely: send only missing file parts to a PC without CD/DVD RW drive from a remote PC via Internet. Other features: use database, bad sector map visualization, working with corrupted folders and much more. High-speed recovery without dying out on bad disc sectors. Moreover, you can pause the recovery process. Media Doctor Lite is simplified version of Media Doctor with remote recovery feature disabled. But it includes complete tool kit for data recovery, copying along with additional tools for storing and analyzing damaged files database. You may upgrade to professional version at a cost of only $20.